Jer Thorp’s story of how the final organization came together. 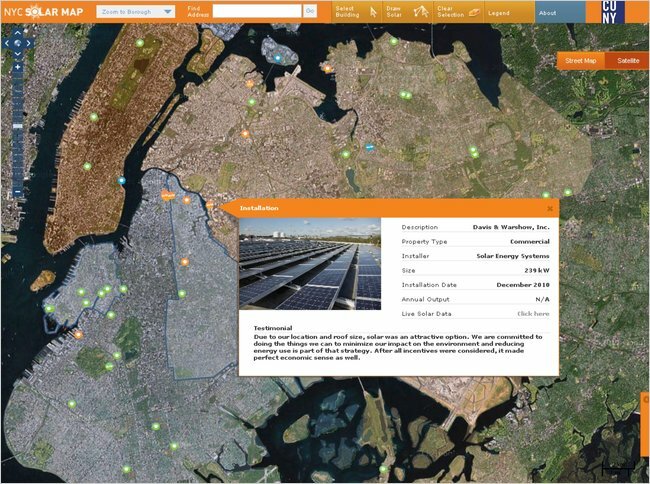 Interactive map shows potential of solar installation in New York. Nisan Leaf Ad: Misleading Information Design? See if you can spot the misleading info-design. The MP$ is shown on a horizontal axis on a linear scale and cars are called out at their relavent markers. That’s fine. However, they’ve added an arch from 0 for each car which seems to be a way of visually implying the route you could travel with that car: start at 0, follow your color in the rainbow and you’ll end up as far as you can get on a single dollar. The distance traveled following the arch is still relatively the same as the distance from start to finish. But the area of the semi-circle under the arch is now growing at a much faster rate than the distance travelled — in favor of the leaf. For example, the ratio of the MP$ of the prius to the leaf is approximately 0.72:1. But if you compare the areas under each one’s arch, the ratio is now about 0.52:1 prius to leaf — a 38% gain for the leaf. And it gets more exaggerated as the initial distance grows: the civic to leaf ratio is 0.42:1 whereas the ratio of their areas is about 0.18:1 — a 130% gain for the leaf. Instead of comparing MP$a to MP$b, your brain is probably comparing (MP$a)² to (MP$b)². Although nobody is sitting down and figuring out ratios like this when they glance at the ad in a magazine, your brain can easily take into account the relative areas of overlapping circles. It shouldn’t be much harder than comparing positions on a number line. The USDA revamped their infographic in favor of a hip new PowerPlate, which, in addition to being super-catchy, is apparently at odds with federal food subsidies as they currently stand. Interesting. The article here. Reminds me of the work of Ihoanna Pani.